Any comparative historical analysis of literature demonstrates from the context of examination that a point of division, a beginning or foreshadowing of something new, is present in various places. This time, aside from the usual division, let us consider the special status of the fin de siècle as an inherently undefinable yet sufficiently recognizable category and a motif for discussion of the intercontinentally virtually unknown but very important Croatian writer Janko Polic Kamov. Some say that an ending of a century is always an improvement on the previous fin de siècle, but also more exalted and feverish, without a possibility of contemporary evaluation of the outcome created by the clash of differing artistic energies. The history of avant-garde has acquainted us with discussions in which art, theory and ideology magically blend, thus creating the reality of the twentieth century, a period of incredible scientific development and progress in all fields but also of the birth of the control of every aspect of life in totalitarian regimes which are to last shorter as the century approaches its close, believing to the bitter end that art, theory and their ideology must have a common denominator. Futurism, with its radical denial of systematic artistic form, perhaps unwittingly opened the doors to fascism, which would ruthlessly exploit it, stripping it of the dignity of an art movement which sought to create a new and better world by destroying the old-up values. The writer whom we intend to discuss here was born on November 17, 1886 in Rijeka, Croatia. He died on August 8, 1910 in Barcelona, Catalonia, Spain at the Santa Cruz hospital probably from the plague, not a full year after the publication of the Futurist manifesto in Le Figaro. He was not yet twenty four. In just three years, he managed to create prose, poetry, drama and essays of great value. Although not large in volume, his work changed the course of modern Croatian literature, bringing into it new, challenging, anti-conventional, even crude motifs, as yet unknown in Croatian literature, in which he anticipated ideas that the new-born European avant-garde was yet to shape into art movements. Rebellious, headstrong, destructive and temperamental, a desperado who felt cursed, he called himself Kamov, after Ham (or Kam) from the Old Testament. In a letter sent on February 10, 1907 from Venice to his brother Vladimir, he states: "Concerning the name 'Kamov': when gray-haired Noah got drunk and revealed his nakedness, his son Kam entered and looked at his drunken and naked father; then Shem and Japheth entered -and covered his nakedness. When Noah awoke from his wine and knew what happened, he said: 'Curse be Canaan...blessed be Shem and Japheth. Kamov to me is a literary program..." Like the Biblical Ham, Janko Polic did not fear looking at things revealed -be it literary tradition, historical structure, individual psychology -sparing nothing and no one., least of all himself. Living at the turn of the century, Janko Polic Kamov wrote at a time when the romantic notion of the world was dying in collision with modern industry and new relations, during that strange transitory and restless period in which two worlds -the romantic and the materialist-existentialist - came head on, in that world filled with the heavy load of reality. Kamov is not just modern, not just the first writer of this new, approaching era, but also a writer whose work is a fully thought through albeit unfinished and unfinalized protoavantgarde artistic concept, the strength and versatility of which, complemented by the tragic destiny of the author, rises to his metahistorical sobering with no counterpart in Croatian literature to this day. Most of Kamov's work was first published half a century after his death and still awaits a full literary-aesthetic and historical evaluation. Ivo Franges, author of the so far best history Croatian literature (1987) would describe Kamov not only as the writer whose work is the beginning of modern Croatian literature, but would further state that the best of Kamov's work was in its artistic quality equal to other European writers of his day; indeed, in the introduction Franges introduces Kamov as one of the best Croatian writers to date. It is not our intention to stress the importance of biography by providing a portrait of the author, but an introduction is necessary.[...] Kamov says that he has no time to build his own philosophy or to dedicate himself to science: "...I write poems, sketches, and dramas because for them all that is required is inspiration, a flash of thought, a moment, a coincidence..." However, he destroyed these traditional literary forms both formally and thematically. He called his prose and dramatic work burlesques, tragicomedies, grotesques, farces or psychological satires, thus demonstrating his intention to expand or even erase the borders between the individual literary genders. Kamov is far from the ideal of artistic harmony, beauty and the poetic language that goes with them; his "poetry of cursing" gets its heavy load of connotation precisely on the background of the aesthetic orientation of Croatian Modernism. Among other things, it meant a break with tradition, a deviation from the outlived forms of literary thinking and literary productions; it was the poetics of the new, leaning towards blasphemy, founded on the ideal of anti-beauty, a poetics attempting to erase the borders between life and art both in theory and in practice; for Kamov himself states that he completely rested his life on his art. In this there is no pretentious, dandified bohemianism which views art as an autonomous and sheltered are of human endeavor; Kamov's understanding of art as life and life as art is much closer to the ideal of the avant-garde doctrine and its antagonistic pathos, than to the artistic literary formula of Matos, the Young Lyricists or the Gric movements. According to Gordana Slabinac "Kamov anticipates some of the later futurist manifestos on synthetic art, but also some of the fundamental theses of expressionism" (The Croatian Literary Avant-Garde , Zagreb, 1980). This modernistic spirit, the anticipation of European spiritual movements which would flourish in the decades following his death, proved exceptional not only for the time when he created it but also in the context of Croatian modern literature. Thus his sentences are torn, rebellious, angry and ruthless -because they come directly from life. For the same reason they are modern; he sensed his time deeply and proposed not only to express the turmoil of life, but also to analyze and understand it. A lot of living went into his less than twenty four years, so much than even today, eighty eight years after his death, we are still overwhelmed with what this young man left us as his legacy. Born in Susak (the easter part of Rijeka), he was expelled from high-schools because his rebellious behavior, imprisoned because of his participation in demonstrations; in his verses he expresses a revolt against falsehood, Phariseeism and Philistinism. 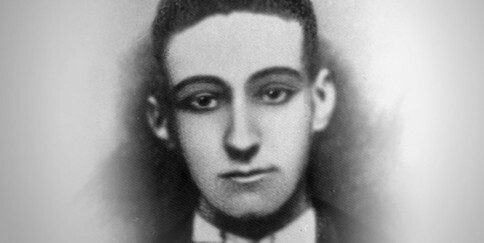 Kamov's writing still reveals a dissatisfied, rebellious spirit, a writer given to uncompromising verrism of expression, one who revolts against opportunism and despondency, who celebrates freedom of thought and, as Antun Gustav Matos put it, was one of "our most dissatisfied unhappy young people." Longing for unlimited freedom, he lived adventurously and often traveled. Until 1906 he lived in Zagreb, leaving only on short trips as a traveling salesman. He began to write. He was reading Ivan Mazuranic (1814-1890) and Silvije Strahimir Kranjcevic (1865-1908); he was initially taken with Zola, but the writers he loved most were Dostoyevsky, Poe and Wilde. In 1904 [He left] with a theatrical company all over Dalmatia and Montenegro; in 1907 through Italy; he spent the summers of 1908 and 1909 at his brother's in Punat on the island Krk, in 1910 he passed through Italy on his way to Catalonia, Spain. In his last short letter to Paula Julija Kaftanic, Kamov wrote his Barcelona address: Carrer de San Pau 55. In following that trace, I discovered many new details which show that in barely 40 days which he spent in Barcelona before his death, he met a number of intellectuals at the Lion d'Or café in the Teatro Principal, such as the poet Joan Maragall (1860-1911), the painters Nicolau Raurich (1877-1945), Joan Miró (1893-1983) and others. He died in Barcelona as a bohemian and a beggar after a madly hectic life. Janko Polic Kamov was one of the most controversial writers of his time and one of the most mysterious of Croatian literature. By the end of 1906, he had prepared for print two collections of poems -The Curse and Pinched Paper - and two plays, The Tragedy of Brains and On Native Soil . No publisher would have them, so in 1907 the writer published them himself. He signed all texts with his pseudonym "Kamov." He went to Venice to visit his brother Milutin, There he wrote, visited museums, galleries and libraries. Shortly thereafter, his father died, then his mother. Under the impression of these two death, as well as an earlier one -that of his sister- he wrote his most important works, the short stories "Sorrow" and "Freedom" and the play "Mama's Heart." His brother Milutin's death in 1908 was the severest blow; he wrote the short story "Skepticism," which was unfortunately lost. Nicola Polic wrote: "This death completely cured him of cursing. Having kept company with Milutin for two years, he was reborn and liberated of the nightmare of his homeland. Hence his life would consist of work, skepticism, tolerance and he was no longer the Great Curser!" (From the memoirs of Nikola Polic). The Great Curser who raped paper, begot Revolution, attacked Job ("the rotten saint") and Moses, cursing himself, as he did in "The Curse," asking heavens "What am I for?," loving life even when "blood curdles and the brain shatters," having as his private Holy Trinity the Brothel, the Asylum and the Hospital - this man cannot be depicted as just the Great Curser, not in this stage of his work. He felt helpless in his environment and attacked religion, ethics, the law -blaming them for the conformist, apathetic, dead society. Nikola Milicevic said: "Kamov wrote in 1905, in the age of Croatian Modernism, which sought harmony, finesse and nobility of the word and of emotion. Into this serenity Kamov burst in like a hurricane, to destroy and blow apart, and even if his blows were sometimes ill-advised, they were doubtlessly the announcement of something new, as yet unheard of. And that Kamov was indeed a fresh voice was felt by many as soon as his poems appeared; time would prove them right." The modernism of Kamov's poetry is felt most in the new structure and composition principles. His stories are full of digressions and comments, introduction of new plots, the simultaneity of events. The most frequent technique he uses in narration is internal monologue or the author's comment. In most of his characters anxiety is the fundamental psychological feature and their common trait in opposition to their environment. Kamov is the first futurist and versilibrist. He said of his homeland that it was "...frog-infested and sunken in morass...;"
Kamov was the first typical Croatian writer of the asphalt. His forma mentis longed for change and movement (in a letter to his brother Vladimir he wrote that only traveling averted him from thoughts of suicide and that in going away he constantly finds new reasons to live), so it is not surprising that he left Croatia at an early age and went to Italy where he was to write some of his best work. At school they always called him the paragraph, because his head was directed to the left, his trunk to the right, and his legs had no direction whatsoever. His back looked as if he carried two knap-sacks under his coat. His face was otherwise good-natured. His head with the elongated crown looked like a cut triangle, while his face resemble another triangle, the based on the cut of the above triangle. Kamov's partly autobiographical novel The Dried-Out Mire ,  in which everything --in a chain-like manner-- can be connected with everything else, is truly surreal. The narration develops through a series of associations. The main character of the novel is Arsen Toplak (Kamov's alter ego): "In a small, rinsed vial Arsen sent his spittle to his physician for analysis. He had catarrh of the lungs and coughed out dozens of yellow and full pieces. Arsen compared them with corals and sponges for that was their texture. And the color he called canary or cornbread yellow." The novel consists of three parts: "At the Bottom" written in 1906/7, "Widening" written in 1907/8 and "Upwards" written in 1909. The second and third part are especially valuable. In the second part we find Arsen in Rome testing his theories. He is haunted by an incubus, Horla, who wakes him up in Rome. This incubus is an insoluble problem, named Horla after de Maupassant's short story in which the unapproachable descendant is thus names. If we are held captive by the past and the present, Horla means depression and nightmare; whereas if we have conquered the past, and transformed the present into a realization of the future, Horla is a stimulus. Mental work filled my days as I wound myself as a clock, all of my life became clockwork: someone listening to it -if my life could be hear- would hear tick-tack... if someone were to watch it, he could see gradual, incessant, permanent progress...thinking about it, one would become convinced that the monotonous sound incorporates the movement of clock-hands. Thus my life is boring if listened to; thus it is uninteresting if watched -namely, because of the impression it makes and the course it is taking. So I open it: let all the screws and coils be seen... everything small, complicated and logical. Arsen returns home where he has no possibility to realize his existence; thus the circle is closed and reopened. Arsen chooses final solitude: "A relief. High up... When this psyche of mine dries out, what will I do at the bottom?" 1. The Dried-Out Mire (1906-09) is in the opinion of many literary critics the best Croatian novel ever written. Unfortunately, it was never truly appreciated nor translated into foreign languages. 2. Along with the expressionist hypertrophy of form, which in Kamov is occasionally combined with surrealistic fantasy (as in "Silence poured from wall to wall like the soul of a horse's death," where the concrete and the abstract make up an almost inseparable semantic formlessness) there are also examples of the transference of the real element into surreality, as in the conclusion of the first half of the chapter At the Bottom: "And the girl who approached with her salable hips and rotten beer left leaving on their table to large, full and live eyes/ As a tip." (Mladen Machiedo , Croatica, Zagreb, 1996). Among Kamov more interesting short stories are "Catastrophe," "Freedom," The Beard," "Ecce homo!," "The village," "The bedbug," and "The suit." This text is a selection of some parts of Mladen Urem's study "An introduction to reading Janko Polic Kamov and the coordinates of Croatian literary avant-garde" in Janko Polic Kamov. Selected Short Stories and Poems . (Rijeka/Zagreb: Centar Drustvenih Djelatnosti Mladih Rijeka and Nakladni Zavod Matice Hrvatske, 1997). We thanks Urem for allowing to reproduce his text.